Whether looking for an outfit choice for weekend getaways or lounging around the block, these trendy pants from well-known brands are the perfect fix for making your ensemble extra fabulous. From sporty styles to laid back designs with varying sizes and colour palettes to choose from, there is something for everyone right here at the Sun & Sand Sports online store. Our selection of casual pants for women has been carefully curated to range from the contemporary to the timeless, from feminine to sporty. Doing wonders for your silhouette, the different size options provide a customised fit for your profile. With cool, black pants to choose from for a sophisticated day at work, or casual khaki pants to help you unwind in the evening. 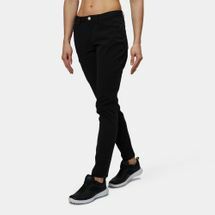 The smooth fabrics of the pants are cut with tapered designs and cropped lengths to give you the perfect combination of both the functionality and the comfort that you need. The different colours and fun prints help you bring about a pop of colour in your day as you pair up the pants with your favorite t-shirt and a comfy pair of shoes. With handy filtering tools, you can narrow down your search for the perfect pair by your preferred selection, be it price, size, brand or more. A detailed description of your selection with a magnified image helps you inspect the product from the very comfort of your own home. Shop now for a truly rewarding experience and join the leagues of thousands of our satisfied customers. Browse and select, check out and pay, and your merchandise will be on track, right to your doorstep anywhere within Kuwait city.